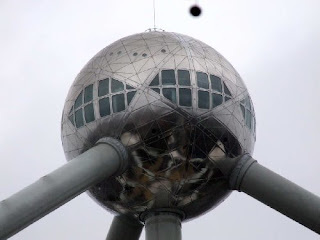 Was erected in 1958 for the World Exhebition. 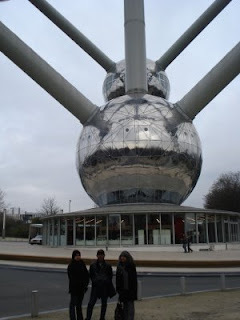 It represents a molecule of cristal iron and symbolizes the 9 provinces of Belgium. Each sphere has a diameter of 18 m.
It is 102m. high and weighs 2400 tons. The designer was Ingenior André Waterkeyn. Like usual people discovered far away countries.Belgian Congo showed life unhabitants(like in a zoo!!! ), but had to send them back after 2 days ! One year and a half later, Congo was asking Independance and got it in June 1960 !! !